Gov. 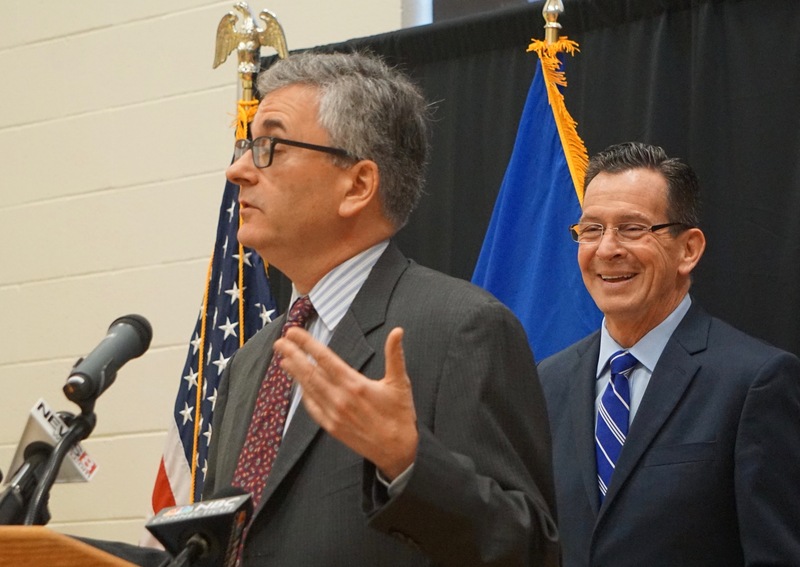 Dannel P. Malloy reacts to Vincent Schiraldi. In a Boys & Girls Club not far from the State Capitol, the administration of Gov. Dannel P. Malloy renewed its push Wednesday to expand the reach of the juvenile court system, a reform endorsed by a leading criminal justice expert at Harvard and imitated by the states of Illinois, Massachusetts and Vermont. Malloy, Hartford Mayor Luke Bronin, Correction Commissioner Scott Semple, Rep. Toni Walker and Vincent Schiraldi, the Harvard expert who recently produced a study supporting the proposal, each offered a rationale for why they thought the reforms a smart effort to protect 18-, 19- and 20-year-olds from permanent criminal records. But an audience the governor needs to reach was absent: Walker, an advocate of juvenile justice reform long before Malloy became governor, was the only lawmaker who heard a presentation meant to coax legislators to take up a revised version of a proposal that never came to a vote in 2016. Rep. Vincent Candelora, R-North Branford, a member of the Judiciary Committee that now will review the measure, said the administration invited him and other legislators to the rollout, while an offer of a briefing might have been more productive than an invitation to participate in a press event. “Attendance at a rollout can be seen as an endorsement, as signifying support,” Candelora said. Michael P. Lawlor, the governor’s criminal justice adviser, said the administration has briefed some lawmakers on the proposal and will continue its outreach as the measure is set for a public hearing by the legislature’s Judiciary Committee. The governor’s revised proposal would eventually give the juvenile courts jurisdiction over criminal defendants up to age 21, unless they are charged with a serious felony or a Superior Court judge determines the case should remain in adult court. It comes to the General Assembly this year with the benefit of a study Schiraldi and another Harvard researcher recently produced for the Juvenile Justice Policy and Oversight Committee, whose members include a dozen legislators and representatives of law enforcement and social services. Schiraldi said the proposal reflects science showing the human brain does not fully develop until the mid-20s, leaving older teens as far more impulsive than someone in their late 20s. Schiraldi said other public policies reflect what science knows about brain development. At the urging of the Reagan administration in the 1980s, states raised the drinking age from 18 to 21 — and motor vehicle fatalities dropped. The Department of Correction recently opened an experimental new housing unit at Cheshire Correctional Institution for inmates up to age 25. Connecticut used to treat all criminal defendants as adults once they reached age 16. The legislature passed a law in 2008 raising the standard to 18, with the changes phased in over several years, after guidance from the Juvenile Justice Policy Oversight Committee. “We planned it. We studied it. And we prepared all the agencies,” said Walker, who is co-chair of the committee. The change is widely viewed as a success: Crime by 17- and 18-year-olds is down. Malloy said his proposal does not excuse criminal acts by older teens, but it lessens the chances that an impulsive act will produce an adult record that will forever limit opportunities for education and employment.